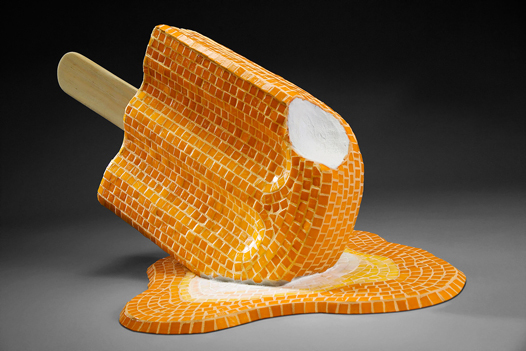 The combination of mosaic’s kinaesthetic colour and play of light interwoven with the endless possibilities of cement sculpture’s 3D forms have allowed me to explore wide-ranging ideas like no other medium. My articulation of those ideas continues to expand as do such visions themselves. Lacking early role models and a sense of convention ironically afforded me tremendous freedom of thought and expression within my chosen medium. Ordinary, everyday objects are given new perspective by altering scale, materials, and texture, frequently conveying an element of humour or surprise. Irony plays an important role in my work – contrasting solids as liquid, hard represented as soft, the familiar in unexpected circumstances. Bright colours and appealing textures welcome viewers, allowing them to experience the work as approachable, uplifting, and memorable. I work in both 2D and 3D, using at least 50% scrap, recycled, and re-used materials. My sculptural forms are constructed almost entirely of post-industrial scrap (polystyrene) which would otherwise be un-recyclable landfill. Re-claimed ceramics and glass provide a broad colour pallet, with occasional hand-made tiles affording specific tones or textures as needed. 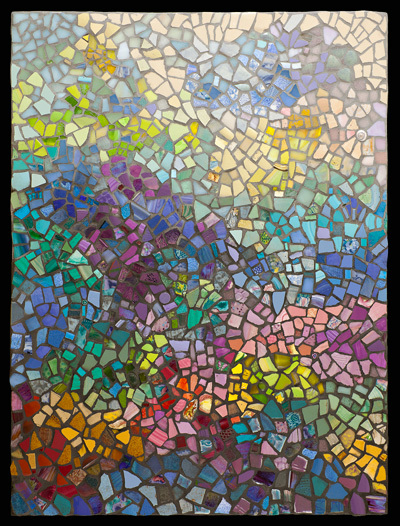 See gallery page for more fine art mosaics.